A Modest Proposal: How About Real Estate Vouchers? Education reform types like to say that no child’s educational opportunity should be determined by zip code. Who could not agree with that? That is why I am surprised that the reformy solutions to so-called “failing schools” do nothing to change a child’s zip code. Maybe that is why voucher programs and charter schools have not been successful. You can bend the rules all you want to try to make charter schools successful, but the evidence shows that charter schools in general do no better than the public schools in educating children and some do much worse. You see, the zip code for the children doesn't change. Vouchers haven’t worked either. I am not sure why we are surprised. Giving a poor family 2 – 5 thousand dollars in a voucher is not going to allow them to find the extra 5K they need to send the child to parochial school, let alone the extra 20 or 30K they would need to send a child to a private school. Vouchers probably would help middle class families defray the cost of sending their children to a school of their choice, say one with fewer children of color or one that teaches creationism. Perhaps that is why they are so popular among some politicians. But for poor children, the zip code remains the same. So I would like to put forward a modest proposal for educational reform. Provide poor families in urban areas where the schools are struggling with real estate vouchers. Real estate vouchers would allow these families to move to a new zip code, a zip code with a high performing public school district. This is really quite simple actually, because despite what the reform types would like us to believe, there is no shortage of very high performing school districts within a fifteen minute drive of most urban areas in the country. Just for example let us take the capital city of that reformy governor, Chris Christie. Trenton, New Jersey’s school district has suffered from years of financial neglect and mismanagement and of course the flight of the monied class to the suburbs. It is a district with many problems, but only a few miles outside Trenton’s borders are at least 6 high performing districts. Districts where the vast majority of the students graduate from high school, excel at the standardized tests, get into the best colleges and have all the opportunities that it is this country’s contract with our children to provide. So what we do for parents who would like their children to attend one of these glorious public institutions is provide them with a voucher that allows them to move into these townships with excellent schools. Fortunately, in many of these areas there are McMansions standing empty due to foreclosures in the last few years, so lots of housing is available, and I am sure that the banks and financial institutions would be happy to work with the education reformers to make it possible for these folks to move to these areas. After all the financial sector was responsible for much of the downturn in the economy, so they are surely ready to do something for society at this point. Let me be clear, these real estate vouchers would be private vouchers. If we took the money from the public school coffers they could never afford to continue providing the excellent education they are already providing. The private sector could use all the monies in their war chests that they currently use for failed experiments like charters and vouchers to underwrite the program. I am sure Teach for America could pitch in a few hundred million from their rich endowment. There is no telling what the Broad and Gates Foundations could contribute. Why just the money that could be redirected from state and national lobbying campaigns could surely provide real estate vouchers for thousands of children. Of course there may be a downside here for the reformers. If enough inner city folks take advantage of the real estate vouchers, there may be a shortage of housing in the suburbs. The solution though is clear. With the inner city emptying out, the wealthy could move in and gentrify the urban areas. With this influx of the monied class into the city, I bet after a decade or two even the public schools in urban areas would improve; new, clean and safe buildings would be built; the best teachers would be found and children would be receiving a first class education despite the zip code. In any reading for meaning activity the text matters, but so does the experience, feelings, thoughts and imagination of the reader. Are changed upon the blue guitar.'" In a blog entry two months ago, I defended reader response theory from what I saw as an attack from proponents of the Core Content State Standards (CCSS). In that entry I said in part, “Teachers use reader response to get students engaged in the reading so that deeper discussion of the text has a basis in student connections to the text (Walsh, 2013).” This month I have been reading a very important new book that I highly recommend to all, Notice and Note: Strategies for Close Reading, by Kylene Beers and Robert Probst. The first thing I noticed about the book is that it is dedicated to Louise Rosenblatt, the great literary theorist who is the creator of reader response theory. Beers and Probst take on close reading is very different from that posited in the CCSS. They argue that a narrow focus on the “four corners of the page” as the CCSS suggest, ignores what we know about meaning making. “Meaning is created not purely and simply from the words on the page, but from the transaction with those words that takes place in the reader’s mind (Beers and Probst, p.34).” Close reading, they assert, means that we should bring the reader and the text close together. The reader matters and the text matters. As Stevens says in the poem above, we all play upon our own “blue guitar” and the creation of meaning cannot be separated from who we are. Further, Beers and Probst are concerned that the text-dependent questions that are the cornerstone of the CCSS approach to close reading will not foster student engagement in reading. Text-dependent questions are teacher created questions. The teacher becomes the repository of knowledge and the keeper of the answers (whether from her own study or from the teacher’s guide). Students will see that reading is an exercise in guessing what is in the teacher’s head, rather than an act of grappling with text to create meaning. This is a recipe for disengagement. In any reading for meaning activity the text matters, but so does the experience, feelings, thoughts and imagination of the reader. Each reader brings a personal “blue guitar” to the printed page. Skillful teachers use that blue guitar to foster genuine engagement and deeper understanding of text. Beers and Probst advocate a kind of close reading that honors what we have learned over the past 70 years about readers and reading. Here is a little gift for Father's Day. With all the controversy over standards, teacher evaluations and standardized tests, one thing remains incontrovertibly true: children whose parents read to them have a leg up on literacy learning. I wrote this poem nearly thirty years ago, while on my way to a conference to speak on the topic of A Fathers' Influence on Children's Literacy Development. It, too, remains true today. And home in one night. ‘Fore I go to bed. Then I’ll read to you. There's a Giant in My Classroom is Published! I am pleased to announce that my new book of poetry, There's a Giant in My Classroom and other poems from around school, has just been published by Infinity Press. The book is a collection of sometimes funny, sometimes silly, sometimes serious and often disgusting poems aimed at children ages 6 to 12 and the adults who know them. 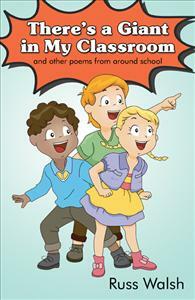 The poems were inspired by the real children I got to know while teaching in schools in Pennsylvania and New Jersey. In the book readers will meet the bouncy Becky, who loves to hop down hallways, brainiac Marty, who always has the answer, and the kid who has the messiest desk in the history of messy desks. Anyone who has ever eaten in a school cafeteria will be able to relate to the poem, "On Friday We Get Pizza." The book is available from amazon.com and from buybooksontheweb.com. If you visit my previous post on "The Test" you can sample one of the poems from the book. I hope you enjoy.